Popular Moe trainer Peter Gelagotis looks to have another smart one in the shape of Levendi, impressive winner of his first two starts. Sent out favourite in a BM64 contest at Mornington on Wednesday, Levendi was not completely at home in the heavy conditions but was a class above his rivals - getting back initially and powering home in the straight to put 1 3/4 lengths on them. 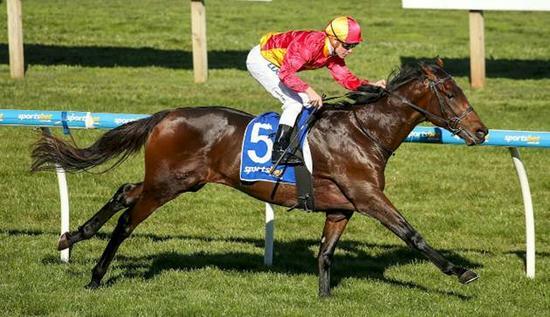 Just as impressive when saluting by 2 3/4 lengths at his Ballarat debut in early June, Levendi has lofty aims in mind with his next run likely to be the Caulfield Guineas Prelude early next month. And after that - well the stable hope he measures up amongst the best of the three-year-olds so that he can earn himself at the big one the, Caulfield Guineas for which another unbeaten galloper Royal Symphony (who races at Flemington on Saturday) is early favourite. "He has been nominated for all the big races," said Manny Gelagotis, mindful that there are still major steps to take - "we will continue to assess him but we have said from day one that he is an exciting colt, he has got a big motor and he shows a lot of class." Jockey Ben Melham has been aboard Levendi for both of his runs and hopes to stick with him, noting that the horse was "a bit above himself" before the race on Wednesday - "there is good improvement in him," he said. "He was not completely happy in the ground so it was a good solid win, he is definitely a horse with above average ability." A $140,000 purchase at last year's Magic Millions, Levendi is a member of the debut crop of Lonhro's five times Group One winning son Pierro who has proven extremely popular at stud; during his first four seasons covering 671 mares. With his name translating to "to be in the presence of a handsome male," it is not surprising that Levendi is a good looking horse and as is still a colt there is a lot riding on the spring with his value to skyrocket should he win a big race or two. Levendi is the first winner bred on the Pierro/Redoute's Choice cross - one that has had another six runners. It will be interesting to see how in time this strike rate improves noting that Lonhro has fared very well with Redoute's Choice mares - 31 winners from 37 runners (83.7% strike rate) with six of those (16.2%) being stakes winners. All up eleven of Pierro's first crop sons and daughters have been winners, the best of those so far being the Gr.3 Magic Night Stakes winning 1000 Guineas nominated Tulip and the stakes placed winners Pierata and Poseidon's Pool. Levendi is the second foal and second metropolitan level winner (Warwick Farm winner Wu Gok the other) produced by Lipari who retired a maiden having been placed in four of her 12 starts - earning black type with a Listed Morphettville Guineas third. Served last spring by More Than Ready having foaled a Sebring filly last spring, Lipari is a daughter of the Gr.1 Australasian Oaks winner Tully Thunder whose dam is the Gr.2 winner Fleur de Chine. This is an excellent Australasian family that has been represented by success on the international stage with Levendi able to boast amongst his relations the big race winners Black Mamba (NZ and the US), Roman Emperor (AJC Derby) and Glorious Days (Hong Kong). Kristen Manning is a freelance racing writer and pedigree analyst based in Melbourne. A keen owner/breeder who loves every aspect of thoroughbred horse racing, she has written two books focusing on the deeds of Fields Of Omagh and Prince Of Penzance.